The Soane office Day Book records Mr Peters / About fair View of / the Lodge ½ day / About Sketches in Book / ½ day Gandy'. 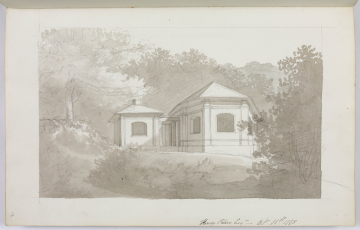 The fair View of the Lodge' may have been sent to Mr Peters since it is not in the Collection. The perspective shows a lodge with a pyramidal roof linked by columns to a larger building - neither of them thatched. This new design in the form of a 'Fair view' was probably sent to Mr Peters. No further drawings for that design appear to have been made so it was probably dropped.